VietNamNet Bridge – With the new school year approaching, 43 cities and provinces across the country are facing a shortage of teachers. According to the latest statistics of the Ministry of Education and Training (MOET), the cities and provinces still lack nearly 76,000 teachers, the Nguoi Lao Dong (Labourer) online newspaper reported. The most serious shortage is seen at the kindergarten education level, which lacks 40,000 teachers, said Nguyen Thi Nghia, deputy minister of education. Nghia said the shortage is seen in many localities, especially Dien Bien Province and the Mekong Delta region. 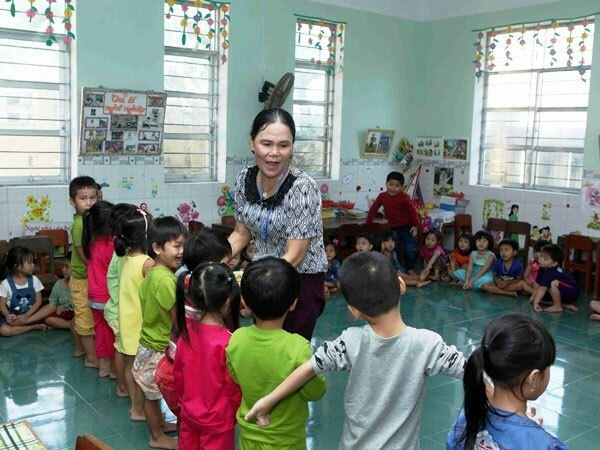 Statistics show that the central province of Ha Tinh alone is still in need of 800 teachers and about 1,200 kids have been unable to enroll at public kindergartens this school year due to the serious shortage of teachers. At the primary education level, the country lacks nearly 19,000 teachers. Meanwhile, there are shortage and surplus of teachers at various secondary and high schools. The high schools lack more than 3,000 teachers. At the secondary level, there is a surplus of about 12,000 teachers in certain districts and subjects, while in other districts and subjects there is a shortage of 10,000 teachers. Explaining the surplus and shortage of teachers, especially preschool teachers, the deputy minister said that as the population had increased, the number of teachers also increased, but not fast enough to accommodate the growing number of students, especially in urban areas and industrial and processing zones. In recent years, the provincial-level education sectors had not been able to hire more permanent staff, as the entire Government sought to streamline payrolls. Limitations in provinces’ planning and forecasting also led to the simultaneous shortages and surpluses of teachers, she said. “The ministry alone cannot deal with this situation because the enrolment and management of educational staff numbers is authorised by the People’s Committee at all levels and the Ministry of Home Affairs (MOHA),” Nghia said. She said the ministry had requested the localities continuously review the local school systems to make appropriate arrangements in order to improve the condition. “We suggest localities move teachers from the areas with slight shortage to the areas with serious shortages to overcome the situation,” she said. According to Nghia, the Government has assigned MOHA to co-ordinate with other ministries and sectors, including the MOET to adjust staff numbers in line with the increase in population. In order to meet the demand of teachers for the new school year, MOET also asked the Government to allow provinces which lack teachers to enroll more staff with short-term contracts, said Nghia.